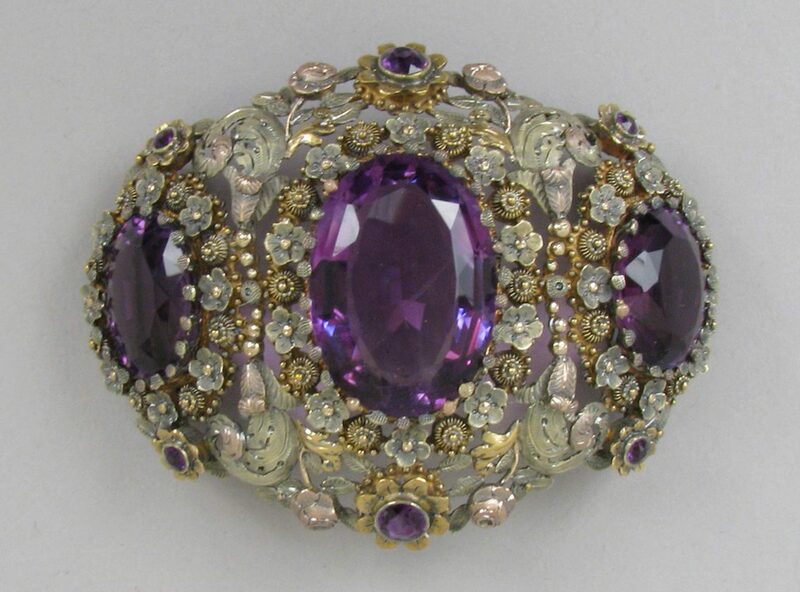 Brooch, gold and amethysts. Paris, France, ca. 1830, 5.1 x 6.7 cm. The Friedsam Collection, Bequest of Michael Friedsam, 1931. Metropolitan Museum of Art, New York. Public Domain. Amethyst is crystalline quartz in colors ranging from pale lilac to deep reddish purple. With a relatively high hardness of 7, the February birthstone is a fine facetable jewelry gem for all purposes. Lower grades of material can be cabbed, carved, and made into a great variety of beads and other ornamental objects. Value for amethysts depends almost entirely on color. Siberian mines once produced the world’s finest stones. They featured a particularly rich purple color that glowed with red and blue flashes. Today the term “Siberian” no longer refers to origins. Instead, this is now a trade and grade term referring to colors similar to those of the amethysts mined in Siberia. 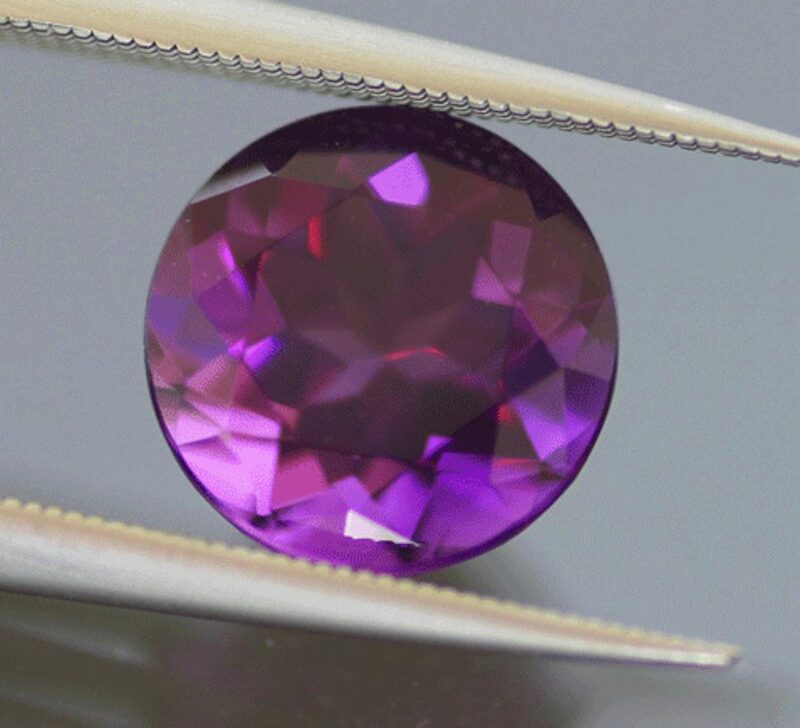 This 2.55-ct amethyst from Zambia possesses the coveted “Siberian” color. Round brilliant cut, 9 mm. © The Gem Trader. Used with permission. Although Siberian reigns atop the value listing, light-colored amethyst has enjoyed a resurgence in popularity. The lightest, pinkish violet shades are called “Rose de France,” a clever bit of marketing. The artistry of gemstone faceting can shine through these gems if given fancy and unusual cuts. Rose de France Amethyst, 11.3 ct, faceted with an Ultra Tec V5 and Fantasy Machine. © Hashnu Stones & Gems. Used with permission. Since amethyst is readily available in large sizes, its value per carat climbs gradually, not exponentially. 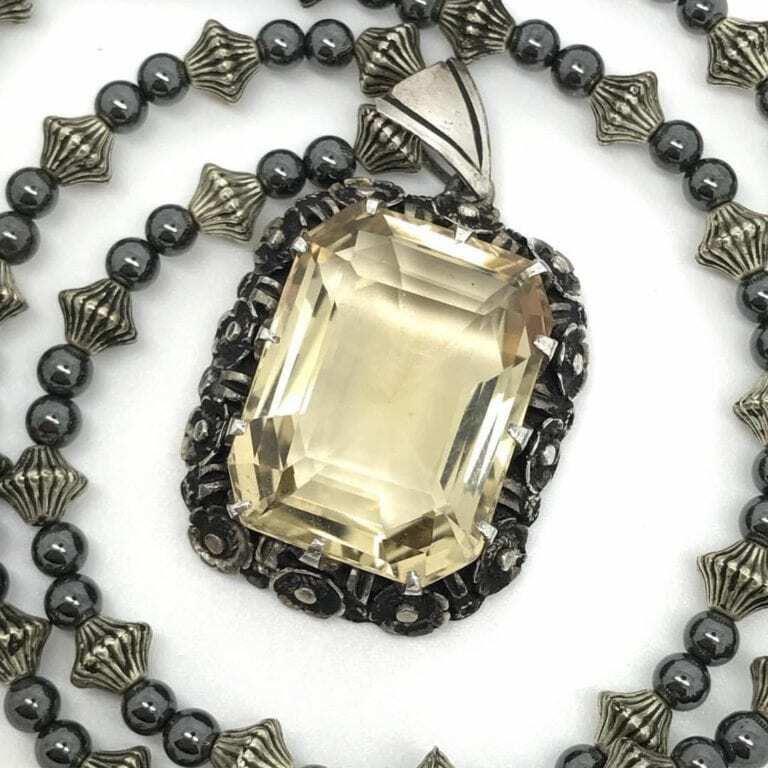 Since this stone is plentiful, there is little reason to pay top dollar for pieces with visible inclusions or inferior cutting. For more information on amethyst value and quality factors, consult our amethyst buying guide. 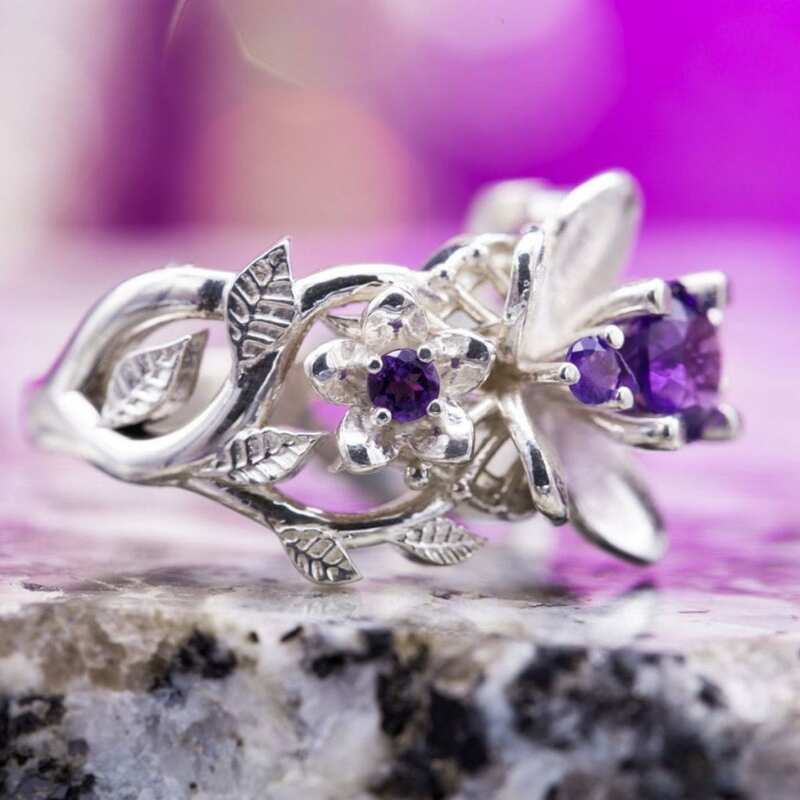 Flower ring with 6 mm amethyst center stone and 2.5 mm accent amethysts. © CustomMade. Used with permission. Colors Pale lilac to deep reddish purple. May have color zoning. Luminescence Inert to weak blue in SW. Inert in LW. 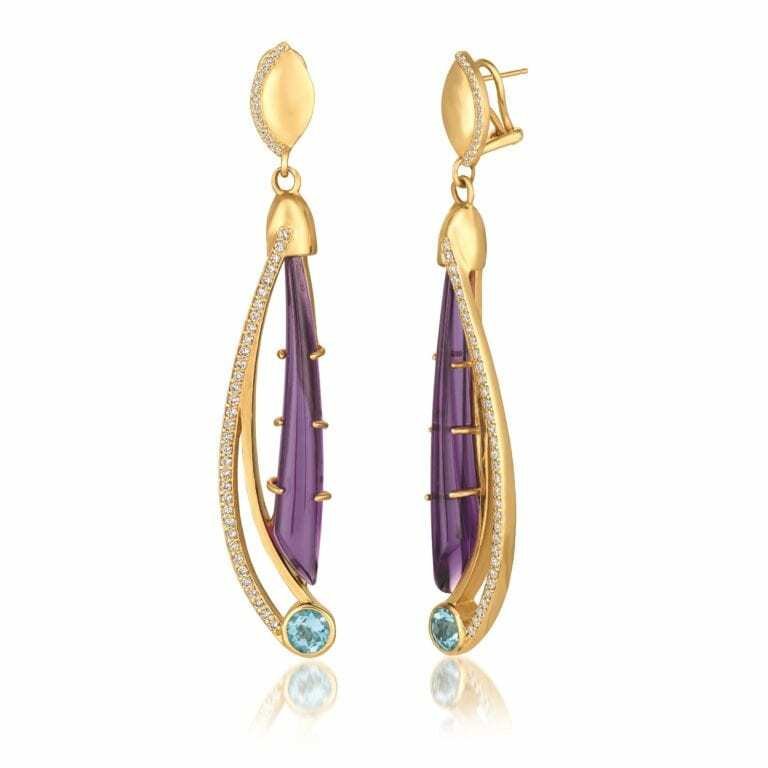 Enhancements Amethyst can be heat treated to improve the color or change it to citrine. Not common. Weak to moderate, purple and reddish purple. From the Ancient Greek amethystos, meaning “not drunk.” It was believed you could drink all night and remain sober if you had an amethyst in your mouth. Generally in pegmatites and veins. Found in geodes in alluvial deposits. Prismatic crystals and negative cavities, thumbprint marks, so-called rippled fractures, and twinning lines. Amethysts. Brazil (6.22, 9.18), Zambia (8.52) // Brazil (4.40, 3.61, 6.41, 6.38). Photo © Joel E. Arem, PhD, FGA. Used with permission. People have prized amethysts for thousands of years. The Ancient Egyptians carved these durable gemstones into the shapes of animals, perhaps as protective amulets. 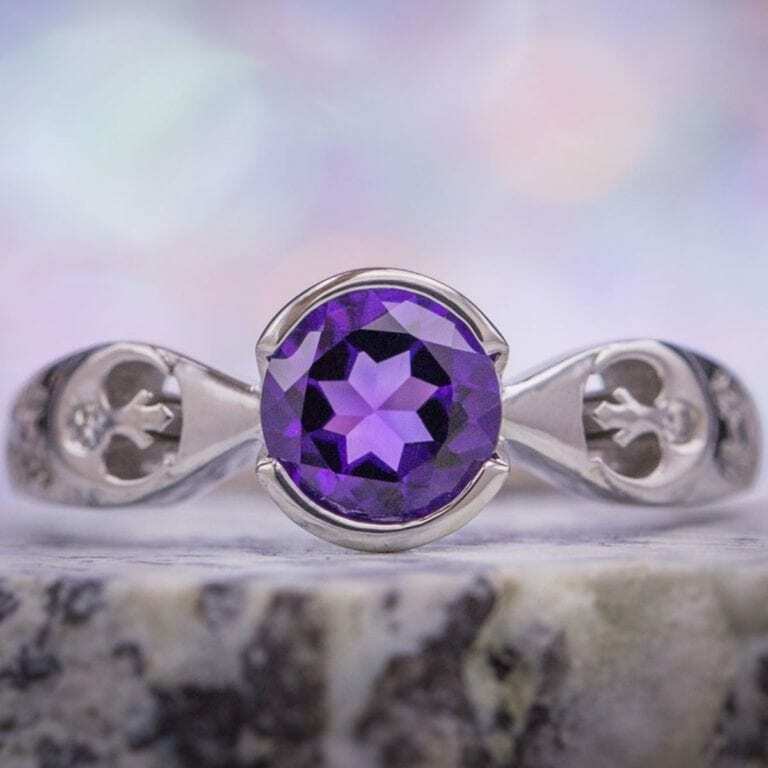 The Ancient Greeks created amethyst carvings and jewelry pieces as well as one of the most enduring bits of amethyst folklore — its supposed power to prevent drunkenness. To learn more about the myths and legends associated with this gem, consult our symbolism article. 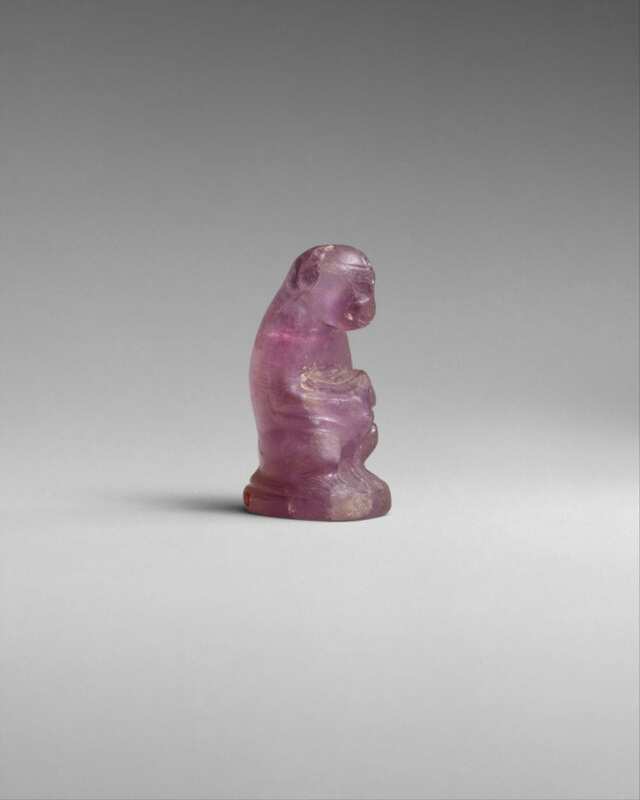 The drill hole and signs of wear on this carved amethyst figure of a female monkey holding its baby suggests this was worn as an amulet. Egypt, Middle Kingdom, 12th Dynasty, 1981-1802 BCE, 3.5 cm. Gift of Norbert Schimmel Trust, 1989. Metropolitan Museum of Art, New York. Public Domain. Transparent, eye-clean amethysts suitable for faceting occur abundantly. Gem cutters can facet amethyst with almost any design suitable to its size and color tone and saturation. For example, Barion cuts work well for large, lightly colored stones, while shallow designs and fantasy cuts work well for darker gems. Skilled faceters can also experiment with custom designs. Custom octagon-cut amethyst, medium-dark reddish purple, 19.35 cts, 16.4 mm, Four Peaks Mine, Maricopa Co., Arizona. © The Gem Trader. Used with permission. 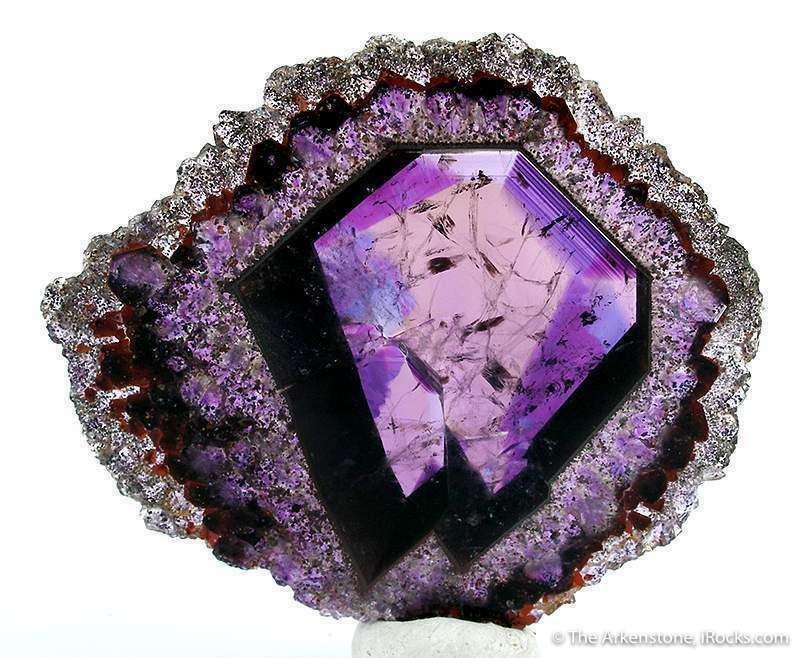 Amethysts can serve as beautiful centerpieces as well as accent or side stones in jewelry. 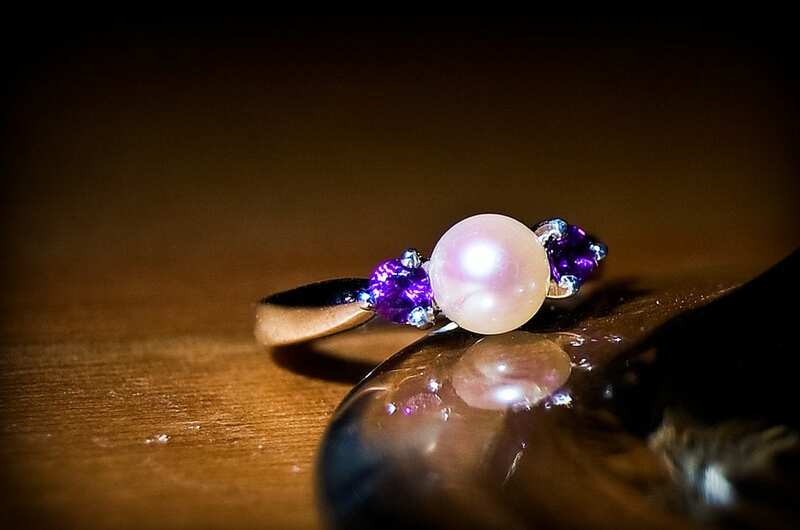 “Engaging,” gold and pearl engagement ring with amethysts. Photo by Ryan Hyde. Licensed under CC By-SA 2.0. 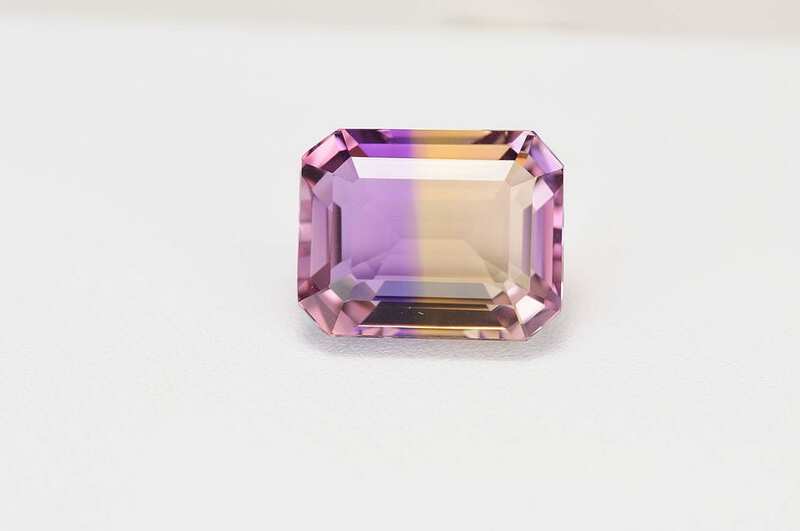 Amethysts may appear similar to other popular transparent gemstones such as sapphires, spinels, and rhodolite garnets. However, since these gems occur rarely in purple colors, you’re more likely to encounter amethysts misidentified as these rarer and more expensive stones. Nevertheless, these gems have notable differences in both optical and physical properties. Sapphires, spinels, and rhodolites all have higher refractive indices (RI), and spinels and rhodolites are also isometric. They also all have greater specific gravity values. Natural amethyst receives its color from the presence of iron and other trace elements as well as natural irradiation. 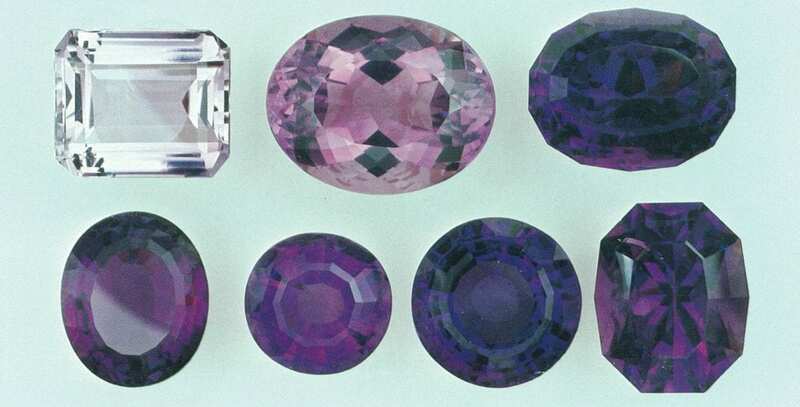 Amethysts may show color zoning, both uneven (unintentional) color distribution as well as color bands (intentional). The deep purple zones in this 9.81-ct amethyst from Boudi, Morocco produce an hourglass shape within the gem. Cushion cut, 15.3 x 13.3 mm. © The Gem Trader. Used with permission. What’s the Difference Between Amethyst and Ametrine? Ametrine is a variety of quartz with two distinct color zones, purple and yellow. These layers result from stop-and-start growth during the formation of the crystal underground, a process known as twinning. Since purple quartz is amethyst and yellow quartz is citrine, this means such a gem consists of amethyst and citrine zones, hence the name. Usually, faceters will cut ametrines into rectangular emerald-cut shapes to highlight the two colors. However, some gem cutters may opt for designs that combine the zones, creating interesting flashes of color. 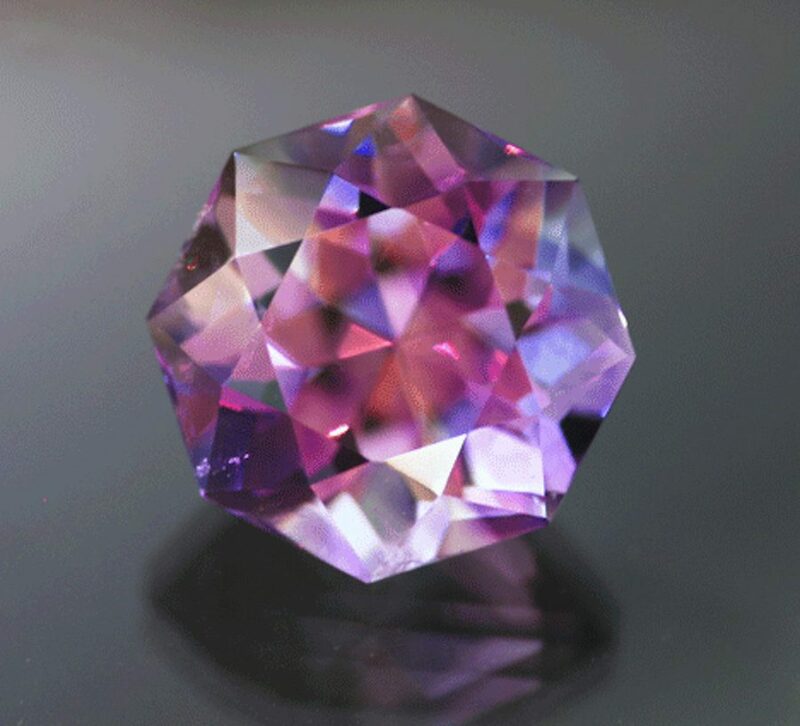 Natural Bolivian ametrine, 10.68 cts. Photo by Gemsphoto. Licensed under CC By-SA 3.0. 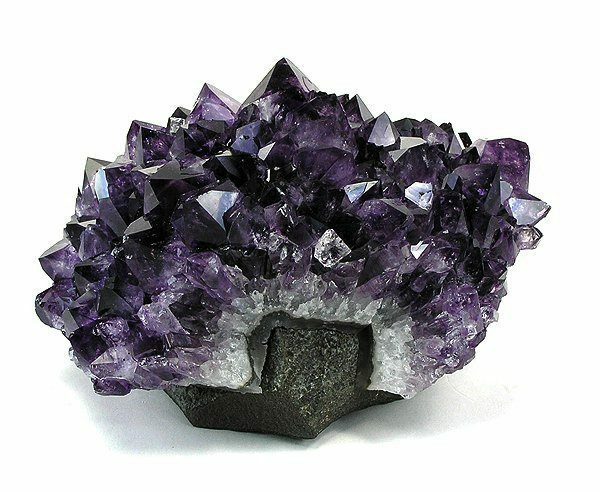 Amethysts can be grown hydrothermally in labs, and manufacturers can also create them by bombarding specially prepared smoky quartz with gamma rays. 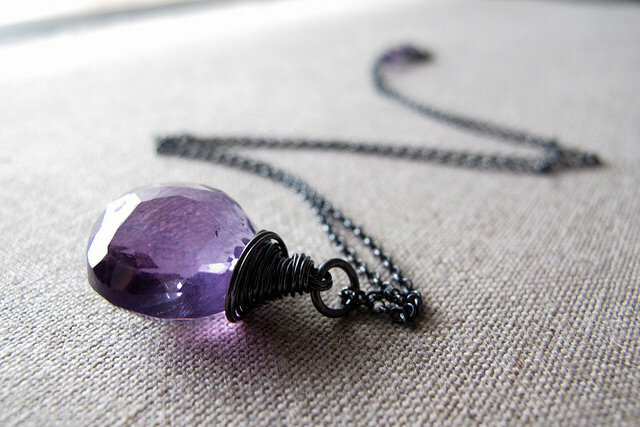 Since natural amethyst is so abundant and inexpensive, little incentive exists to purchase synthetics. However, synthetic rough material is sometimes sold as natural rough. 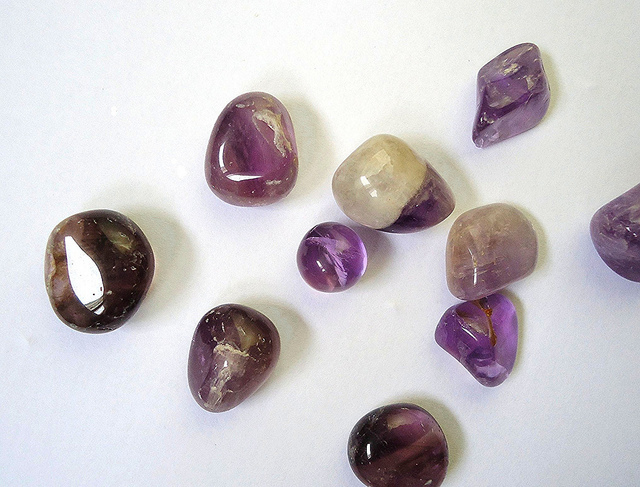 A variety of treatments can change the color of amethysts. However, strictly speaking, only those gems with lilac to deep purple colors remain amethysts. 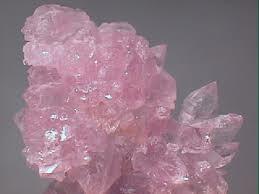 All others simply become different colored varieties of quartz. 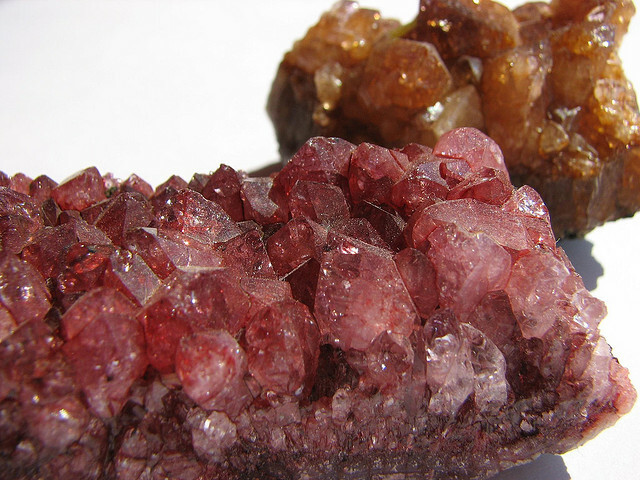 For example, amethysts heated to yellow or red-orange colors are, by definition, citrines. Heat treatments can lighten amethyst, turning it green, blue, or yellow-orange. This undetectable treatment has excellent stability. 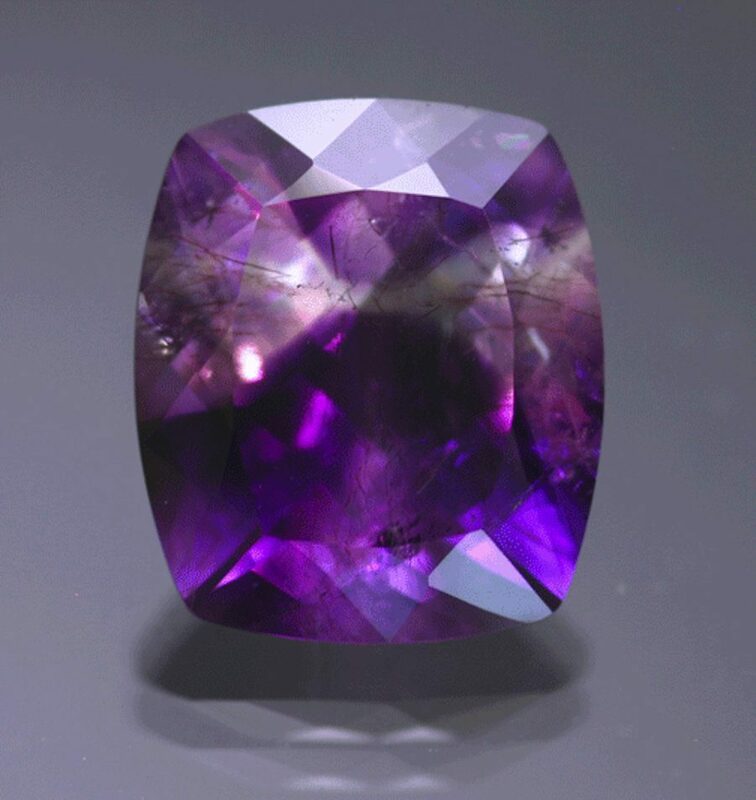 When heated to 400-500º C, amethysts may turn brown, red, and sometimes a green color. These green quartz gems are known as prasiolite. Irradiation plus heating may also produce brown, orange, and yellow hues. Today’s major sources are Brazil, Bolivia, Uruguay, and Zambia. Brazil can produce stones of large size but generally moderate color. They often show uneven color, despite the best efforts of cutters to minimize it. Many gem enthusiasts prefer the usually smaller but more richly colored stones from Zambia as well as, more recently, Uruguay. Deep purple amethysts on matrix, 14.2 x 9.8 x 8.4 cm, Artigas, Artigas Department, Uruguay. © Rob Lavinsky, www.iRocks.com. Used with permission. Four Peaks, Arizona produces top-quality facetable amethyst. These three amethysts from Four Peaks, Arizona have a blue component to their striking, deep purple color. 7.0-ctw, 10 x 8mm. © All That Glitters. Used with permission. Australia; India; Madagascar; Mexico; Morocco; Namibia; Nigeria; Russia; South Korea. United States: Georgia; North Carolina. This color-zoned slice of amethyst comes from an unusual stalactitic growth. 8.2 x 7.5 x 0.3 cm. Jalgaon, Maharashtra, India. © Rob Lavinsky, www.iRocks.com. Used with permission. In terms of size, amethyst is one of the exceptions of the quartz family. Most quartz can grow quite large and be cut into gems weighing thousands of carats. However, there are few clean examples of amethysts of 100 or more carats. 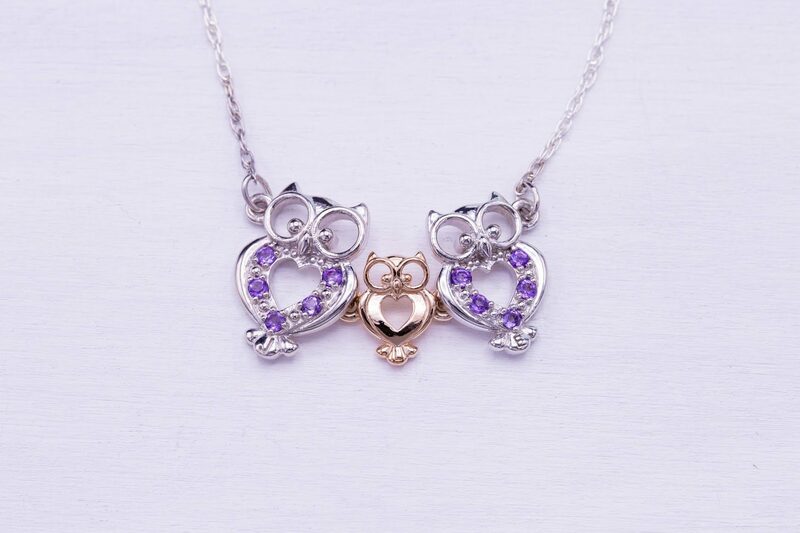 Amethysts of all sizes can make beautiful jewelry, like this owl motif pendant. © CustomMade. Used with permission. 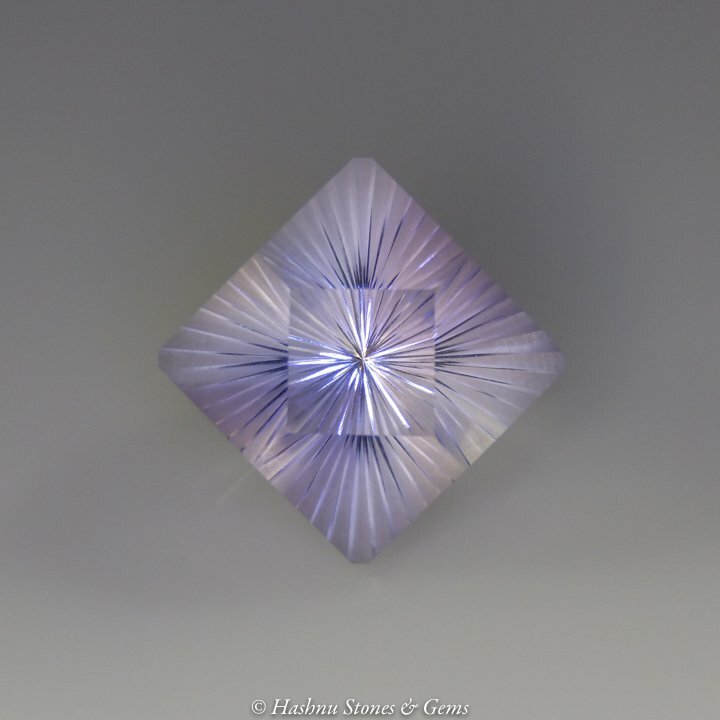 Although transparent amethyst occurs commonly, this rarely happens in very large masses. The fine gems at the Smithsonian Institution (Washington, DC) are exceptional, such as the 1,362-ct Brazilian stone and the 202.5-ct stone from North Carolina. Siberian amethyst: dark purple color with flashes of red and/or blue. All these names are erroneous and misleading. Avoid using them and be alert if vendors use these monikers without explaining the gem’s true identity. As quartz, amethysts belong to a species distinct from topaz, sapphire, and kunzite. Consult our List of Gemstones with False or Misleading Names for more examples. Lapidaries can use amethysts for any type of jewelry setting, including rings, as well as carvings, beads, and other decorative objects. 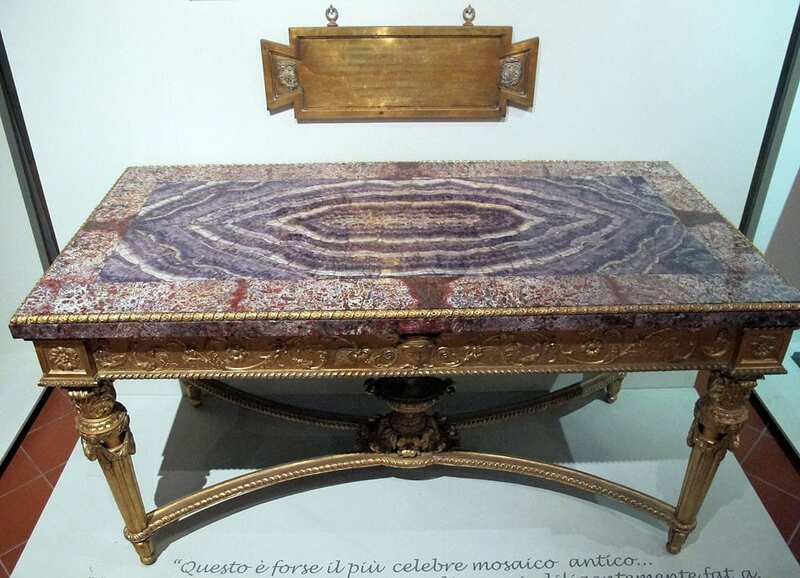 This 18th-century gilded wood table features an amethyst top as well as other gemstones. From the collection of the Palazzo Bonacossi. Photo by Sailko. Licensed under CC By-SA 3.0. Although quartz gems are very durable, amethysts are sensitive to extreme heat. Furthermore, inclusions can make these gems susceptible to shattering in ultrasonic cleaners. Avoid mechanical cleaning systems and stick to a soft brush, mild detergent, and warm water, instead. See our Gemstone Care Guide for recommended cleaning methods.